There are so many ways to celebrate Xmas, but have you ever done it Russian style: dancing to a vintage gramophone DJ set, holding an elegant yet mysterious vodka cocktail in your hand and feasting your eyes and pallet on a bountiful buffet? Now you can! As KinoVino Christmas at Pushkin House is sold out, we are adding an extra event to celebrate the festive season with our special guest, a Moscow-based gramophone DJ and performer, Anton Borisovich! Join us at Green Lens Studios for a vintage party: antique gramophone performance, projection of silent pre-Revolutionary era films, vintage cocktails and a buffet style reception! Feel free to envelop yourself in some vintage apparel, to eat, drink and dance the night away! Take a photographic journey to the curious world of Soviet health spas at the launch of the new book Holidays in Soviet Sanatoriums by Maryam Omidi. Join us and FUEL Publishing at the Calvert 22 Bookshop, where you can preview the book’s stunning photography and purchase a limited edition slipcase copy. You can also taste KinoVino‘s Soviet canteen-inspired dishes like vitamin salad, buckwheat porridge and fruit-infused vodka cocktails. After a successful edition in Bristol in November 2016, the Severn Sisters’ Feast, organised by chef Romy Gill, MBE, comes to London for one night only! On 4th October Borough Market will open its doors to 100 guests who will be treated to an amazing feast prepared for them by eleven of the most remarkable women on the U.K.’s food scene. Joining forces in the kitchen will be Zoe Adjonyoh, Rosie Birkett, Xanthe Clay, Natasha Corrett, Elly Curshen, Maria Elia, Romy Gill, Olia Hercules, Chetna Makan, Paula McIntyre and Alissa Timoshkina. Together they will deliver a festive menu featuring seasonal produce and marrying their vibrant multicultural cooking styles. 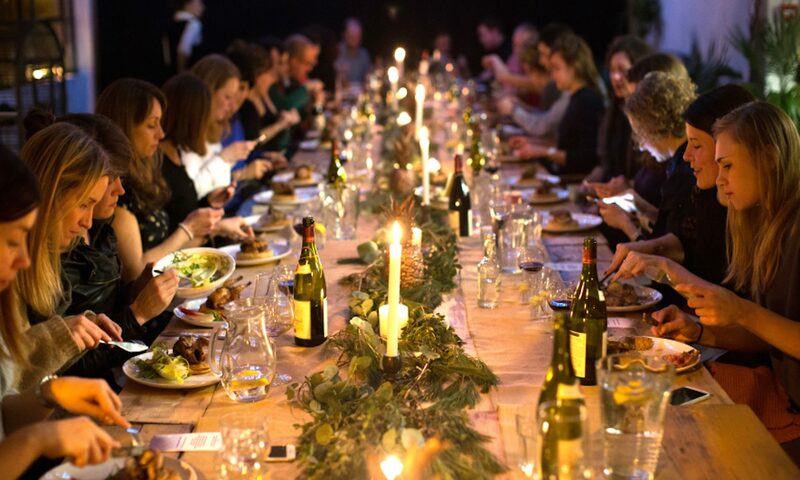 A true one-off celebration of local produce, female culinary talents and the importance of sharing food, the Severn Sisters’ Feast will be a landmark event in London’s food calendar. Join Joey O’Hare (Hare on the Hill) and Alissa Timoshkina (Kino Vino) for a 4 course vegcentric supper club celebrating the bounty of the summer. Joey and Alissa are preparing a sharing feast full of seasonal salads, bold flavours and cultured foods whilst Our/London Vodka will be expertly pairing the dinner with cocktails (alcoholic or non-alcoholic) using fermented and preserved ingredients. Following her appearance on Masterchef the Professionals, Joey O’Hare launched a vegcentric supper club, Hare on the Hill. Her food is seasonal, vegetable focussed and incorporates plenty of cultured food for the complexity of flavour they bring to the party – Joey believes this to be the key to exciting vegcentric cooking. Her menus are directly influenced by weekly shops to the local farmer’s market in Herne Hill. Conceived by film curator and avid cook, Alissa, KinoVino marries best of world cinema with some of the most innovative menus inspired by the films and brought to life by London’s leading chefs. Alissa is also a cook herself, with a passion for fermented foods and vegetarian cooking, as well as food from her native Siberia, Russia. I am really excited to continue my exploration of Russian cuisine. Using vegetarian and fermented produce only, I will share some of my favourite dishes with you in a relaxed and cosy setting of Green Lens Studios.You can look forward to a cold beetroot soup, a mushroom buckwheat risotto and other vegetarian delights. On the 28th I will welcome a guest chef – S Yuma Hashemi – to collaborate with me on a fusion menu, introducing Yuma unique dishes cooked on an open fire in front of you. Vodka will be served on the house and you will also be able to purchase some wine and beers with your meal. KinoVino is joining forces with Kino Klassika Foundation at an extraordinary screening of Bernardo Bertolucci’s legendary epic, 1900 (Novecento). This Easter Saturday extravaganza will see Kino Klassika screen a pristine Italian language print of the original 5 hour and 20 minute version of 1900 (Novecento) with English subtitles. Boasting stellar performances from Gerard Depardieu, Robert de Niro and Donald Sutherland, the screening is a once in a lifetime opportunity to see Bertolucci’s masterpiece on the big screen. It will be complimented by KinoVino treating cinephiles to a rustic Italian buffet and wine reception in the cinema bar during the hour-long interval between parts 1 and 2. A specially-designed menu will feature prosciutto, peach and honey crostini; sundried tomatoes hummus with crudités; artichokes, pancetta, peas and mint salad; and a selection of fine Italian wines. Original room and table decor will heighten the event’s revolutionary theme. It is great to be back to one of my favourite spots in London to serve you a new menu that I have been developing. Drawing on some of the favourite dishes from my childhood, I have created an Eastern European menu with a few twists and touches here and there. Come along on the weekend of 25&26 March to Calvert22 Foundation, I will be there serving the food at their cafe from 12pm to 6pm. No booking in advance is required. I really can’t wait to share these dishes with you! Taking inspiration from my Soviet Eastern-European roots, I will cook up a delicious feast at Neal’s Yard Pride, using fermentation and pickling as key techniques for each course. Join an intimate group of diners for a cosy and fun night of Russian classics with a contemporary twist. It is an absolute pleasure to take part in Oliver Rowe’s Konstam Popup in Calvert 22. Oliver will be serving some incredible food inspired by Eastern European and Jewish cuisines, while I have curated a programme of films exploring Eastern European Jewish history and food culture. Oma and Bella (Alexa Karolinski, 2012) is a deeply touching and endearing documentary about a life-long friendship between two elderly Jewish women. While rooted in the tragic history of the Holocaust, the film is an ode to their resilience, survival and joie de vivre. It is a celebration of friendship, tradition and above all of Jewish food. It is through the food which Oma and Bella prepare together that they remember their childhood, maintain a bond to each other and explore questions of memory, heritage and cultural identity. They drink vodka, sing Yiddish songs and dress up to go out with their friends. Oma and Bella will evoke your unconditional affection and admiration from the very first scene! A screening of a legendary Soviet film Commissar (1967, Aleksander Askoldov). Based on a renowned short story by Soviet-Jewish writer Vassily Grossman, the film tells a story of a Red Army commissar who temporary lodges with a poor Jewish family to give birth in the midst of the Russian Civil War. Filmed with a unique poetic vision, the film was banned upon its completion and not shown until 1988. This work is a truly unique gem of world cinema. Don’t miss this rare chance to see it. A gastronomic collaboration between a team of female chefs serving a feast of unique dishes created for this one-off charity dinner. I will be teaming up with Romy Gill to cook a main course of Indo-Siberian Goat curry with a pickled mushroom&smetana relish. An incredible 7-course menu and a welcome drink for £62.40. All profits go to the charitable cause. It is very exciting to host my first food popup at Calvert’s cafe. Tapping into my Jewish-Russian culinary heritage, I will serve an array of gastronomic classics like latkes, farshmak and blintzes which you can enjoy with a signature drink ‘Medok’. No booking required, just come along to the cafe and get some treats! On Friday 1st July Cafe Noor will be transformed for an evening of Russian Feasting and Singing. The Russian Menu will be created specifically for this event by Alissa Timoshkina – Alissa began the KinoVino supper club that has taken London by storm over the last year and we are delighted to welcome her back for the second time at Cafe Noor. To accompany Alissa’s feast for the senses will be The Brighton Russian Choir, led by Polina Shepherd. The award winning Brighton & Hove Russian Choir promotes Russian harmony singing and traditional Russian repertoire. This promises to be a very special evening, so don’t miss out!